How do I track time for ongoing retainer projects? Tracking time for ongoing retainers is a bit different than tracking time for “normal” fixed projects. 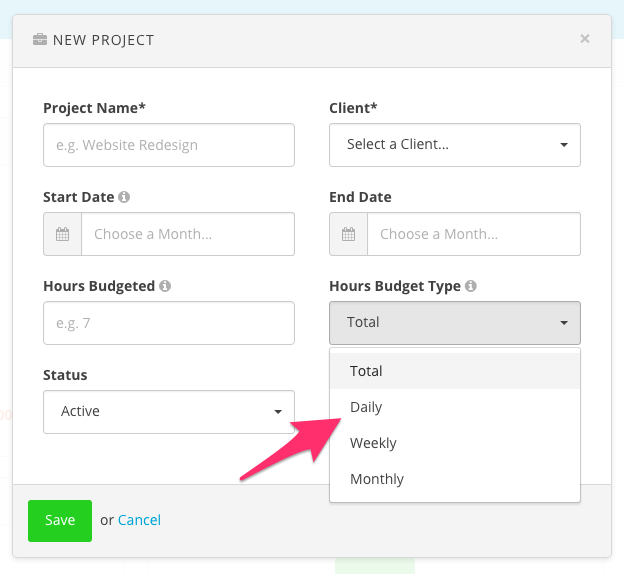 When creating a project you have the option to enter a fixed amount of hours you’d like to budget for the project. For example, if you know you want to work a maximum of 40 hours on a project you can enter that amount into the Hours Budgeted field when creating or editing a project. This works great for fixed projects where you have a set amount of hours you can budget. But it’s not very helpful when you have an ongoing retainer project that has a certain amount of budgeted hours every week, or every month. For example, you might have a monthly retainer in which you’d like to budget 40 hours every month, instead of 40 hours total. And you’d like to see a running total of your tracked hours for the month vs. your budgeted hours for the month. Harpoon handles this using the Hours Budget Type option. You’ll find this option when creating or editing a project. Despite what option you select for Hours Budget Type you’ll never lose your actual time-tracking history. All time tracked will always be saved. It’s only the recorded hours progress and budget that’s reset every month (or every week or every day). This allows you to see how much time you have left to give to a project for that month (or week or day). Can I add recorded hours entries without using the Timer? How do I know the profit/loss for a project? How do I record an expense for a project? What do the different project statuses mean? 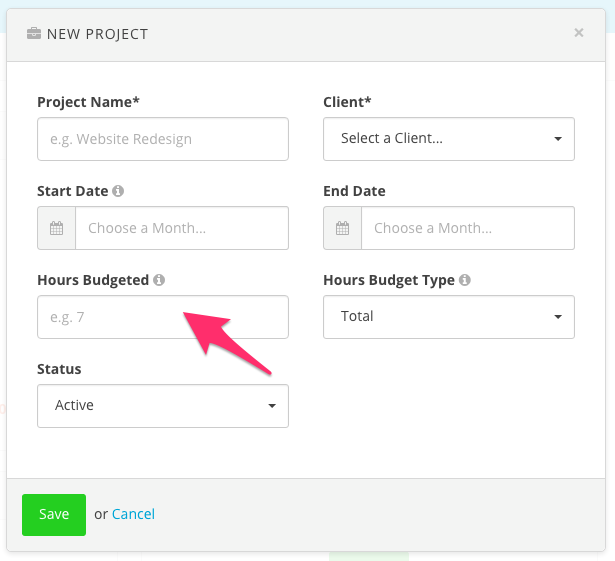 How do I know if I’ve gone over my budgeted hours for a project? How do I budget hours for a project?